Before I begin this article I need to say that the article title should have been “How To Keep Your Head STILLER As You Swing”. The reason I didn’t call it that is because it sounds weird. But here’s why I said that…. When you swing your head should move. It should not be perfectly still. When you make your backswing your head should move away from the target. Then when you move down into impact your head should move back to a place close to where it was address, although it should be lower and your head at impact should not be in front of where it was at address. I have completed a comprehensive analysis of some of the top golfers in the world and it confirms what I’m saying. You can see those findings here. Having said all of that…. it makes sense to try and minimize any unnecessary motion. If you have excessive head motion I would recommend you reduce it because simpler is always better. But how can you check and then go about fixing it? Well, a simple way to check whether you have too much head movement is to simply get someone to video you as your swing. Then go through frame-by-frame and see how much your head moves. A better way I believe than doing that is the drill I’m about to give you. Either way, knowing your head is moving a lot is the 1st step, but then what can you do to minimize movement as you’re actually swinging? Well, today I have a very simple way of doing this. To do this drill you will need a can and a ruler. 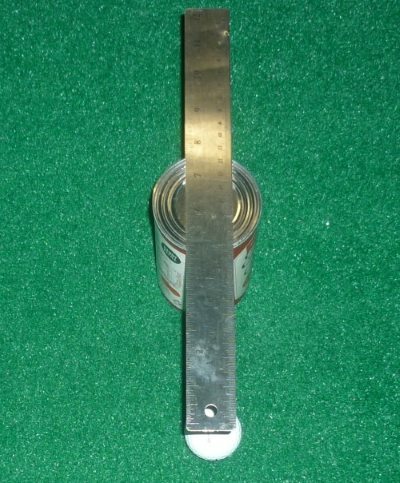 Once you have those two things then setup to hit a golf ball and place the can just outside the ball and the ruler on top so that when you setup to the golf ball you can see the tip of the ruler over the ball. On the right is a picture of this. Now what this is doing is giving you a reference point. Because as you swing I want you to simply watch the ruler and golf ball and see how much movement there is. This will give you great feedback as to what your head is doing in real time. And that’s very important. Because it’s all very well to know from video that your head is moving too much but what do you do about it? If you do this and you can see the entire ball at any point in your swing it means you have a lot of head movement and I would suggest you work on minimizing. Note that I’m not saying to keep your head perfectly still. And I’m not saying to try and keep your head down. I believe it’s perfectly fine for your head to move slightly to the right in your backswing and then return to a place close to where it was at impact but not in front. When you do this drill it’s easy to check that you’re doing this. Also, it’s good for your head to move down on the downswing. Now in the case of this drill, awareness can often be curative. Because I’m not saying you need to try hard and keep your head still as you swing. Doing that will cause tension. And excessive tension in the golf swing is never good. Instead you simply need to hit balls with the intention of keeping your head stiller. Then hit shots and observe how you’re doing compared with your intention. You’ll find when you do this that your excessive head movement will reduce without you trying hard to do it. And that, my friend, is a very good thing! You want to keep excessive tension and trying out of your golf swing. So don’t try and keep your head perfectly still as you swing. Instead, use this awareness exercise to monitor what your head is doing and then if necessary put your attention on reducing it. If you do that you’ll cut out wasted motion of your head and your golf swing will be simpler, easier to repeat and you’ll hit the ball better, consistently. All good things I’m sure you’ll agree. So go out and do this drill to see how you do with head movement.